We are using tanagers as a model system to study species diversification. 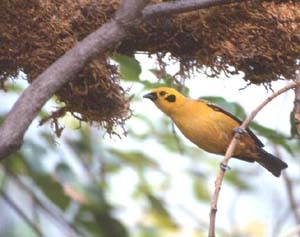 The tanagers represent a major radiation of about 400 species of Neotropical birds. Compared to other avian groups, the tanagers (Passeriformes: Thraupidae) are a large clade, representing roughly 4% of all avian species and 12% of Neotropical birds. Although primarily known for the colorful, charismatic species in the group, many species of tanagers are more cryptically colored. Tanagers are also ecologically variable, and found in virtually all terrestrial habitats in the Neotropics, from dense tropical rainforest to open grasslands to high elevation regions of the Andes. Some species have bills adapted for eating large seeds, others feed on nectar, others fruit, and others specialize on insects. We are reconstructing a multi-locus molecular phylogeny (i.e., an evolutionary tree) for all species of tanagers to reveal patterns of species diversification in the group. This phylogeny provides an opportunity to explore correlations between rates of species diversification and rates of phenotypic evolution. Tanagers vary in many characters including plumage coloration, sexual dimorphism in plumage, vocalizations, ecological niche, beak size and shape, and other aspects of morphology. We are comparing rates of character evolution to species diversification using the tanager phylogeny. In particular, we are comparing the relationship of species diversification to changes in characters related to natural selection with changes in characters more closely associated with sexual selection. Recently, we have begun to investigate genetic differentiation of birds on California’s Channel Islands, a group of eight islands located off the coast of southern California. These islands are home to diverse animal and plant life and are often referred to as the “Galápagos of California”. Given their proximity to the mainland, the degree of endemism is striking, with 13 of 41 native breeding land birds showing phenotypic differentiation compared to mainland counterparts. However, very few species have been studied genetically. Our plan is to compare levels of genetic and phenotypic divergence across a suite of avian species, looking for common patterns across species found in the same environments. So far, we have worked on Horned Lark (Eremophila alpestris) and Spotted Towhee (Pipilo maculatus). Because islands provide ideal evolutionary laboratories to study adaptation and speciation, the Channel Islands provide an excellent system to test hypotheses about the effect of isolation on both phenotypic and genetic divergence. We are studying genetic variation in a suite of bird species whose distributions are centered within the California Floristic Province. The goal is to describe how different species have responded over time to biogeographic changes. Although genetic variation within many species of vertebrates have been studied in this region, very few birds have been investigated. By combining data from these different species, a better understanding of the biogeography of the region should emerge. This is important for understanding the impact of past geologic events and contemporary habitat changes on species’ distributions. Thus far, we have surveyed genetic variation in three co-distributed species: the California Thrasher, the Wrentit, and the White-headed Woodpecker. In addition, we have preliminary data from several other species. By studying multiple species, we will be able to address whether all species responded in the same way to the same biogeographic events. That is, what is the historical pattern of community structure? Have some species co-existed in the same community and habitat longer than others? Are some species more likely to undergo range expansions and habitat shifts? To learn more about our research, please see the Publications page and read about student projects in Lab Members.